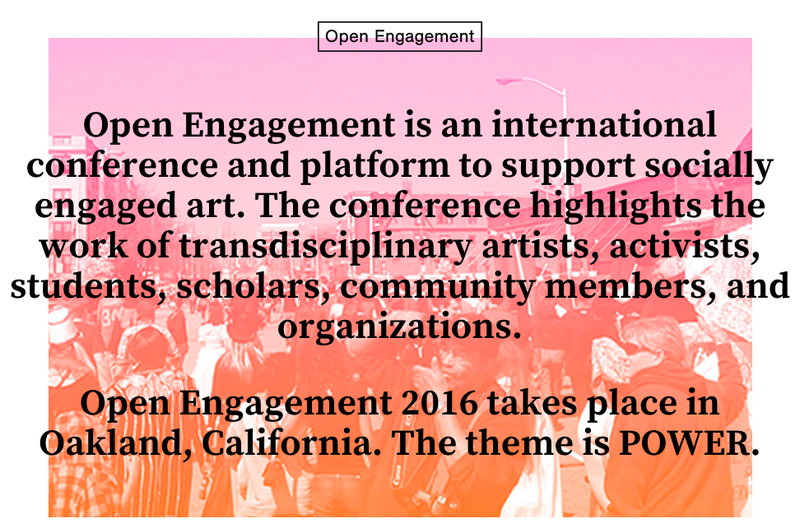 Open Engagement 2016 –– POWER will take place April 29 – May 1, 2016 at the Oakland Museum of California and additional sites throughout the Bay Area. As part of the ARC | Arts + Design partnership with the 2016 Open Engagement conference, we are looking for extraordinary CAL BERKELEY students to join Open Engagement’s Internship Program! Join the OE team as an intern! Internships are available with focuses in Programming, Administration & Communications, and Curatorial. Interns will work closely with OE’s small core team to execute OE 2016. All interns are expected to demonstrate an appreciation for and understanding of Socially Engaged Art. OE internships are unpaid, but OE is happy to work with your educational institution to arrange for course credit. Interns must be highly organized, reliable, detail-oriented, and possess excellent written and oral communication and strong interpersonal skills. Must be comfortable working with Apple and PC computers; Google Drive applications; social media; Microsoft Word, Excel, and PowerPoint and basic internet research skills. Questions: Contact Lauren Pearson: lauren.pearson@berkeley.edu or 510-642-4268.